Deliciously exotic organic and Fairtrade Indian chai. 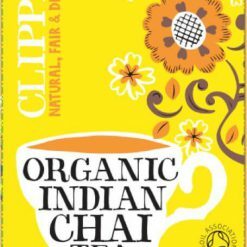 Clipper Organic Indian Chai is a real delight to the senses: a black tea with a warming blend of traditional spices. It isiIncredibly refreshing, with a rich, spicy flavour, bright colour and wonderfully soothing and distinctive aroma. The organic tea comes from a remote tea estate high in the Nilgiri hills of south India. The organic spices are from Sri Lanka. The growing methods ensure the protection of the land and the people who live on it, creating a balanced, fertile, sustainable environment. 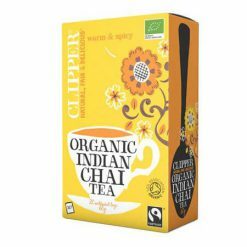 In 1994, Clipper Tea became the UKEEs first fairtrade tea company. The products contain “redients and each teabag is unbleached, as nature intended. Many products are also naturally caffeine-free or, in the case of Assam Blend, caffeineless, having undergone a non-chemical decaffeination using carbon dioxide. Ingredients: Organic, fair trade certified black tea, organic cinnamon, organic lemon peel, organic cardamom, organic cloves.